This Friday we attended our first play date with a child I don't know from nursery and one of T's new friends. I must admit I was totally out of my comfort zone but we had an awesome time, here are some tips from someone who's not a natural with these situations! 1. 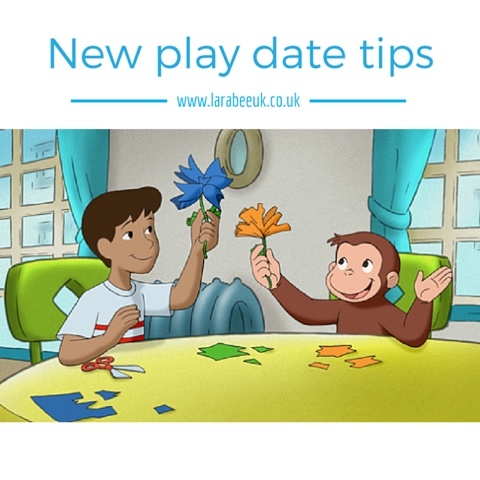 Only book a short play date for the first time and have a get out clause not to allow it to go on longer, best to leave wanting more than sit there for 5 hours looking at your watch dying to find an excuse! 2. Wear good socks! You don't want holey socks if they have a no shoe policy! 3. Make sure your child has a bath/shower before you leave, if your kids are anything like mine, stripping off to put dressing up clothes on is the first thing they do! The last thing you want is pen on legs and dirty toes! 4. Take a familiar toy to use in case of friction to distract your child. 5. If you take cake, gluten free carrot cake is a good option, slightly healthy and good in case of intolerance. Oh and of course bloody delicious! 6. If you take some healthy snacks, better to have something that any child can have than take sweets to a house who don't have sweets. 7. Take a change of clothes for you and your child/children to leave in the car. Highly embarrassing if something gets spilt or someone has an accident, this actually goes for any occasion though doesn't it really? 8. If it's not clear, assume food isn't provided or check as subtley as possible, for instance a play date we went to was arranged 1-3, I thought lunch wasn't included in the invite but I followed up with 'see you after lunch' to make it clear from our side that we are not expecting to be fed! Fab list - my thing is do I take something or not take something. I've started arranging play dates out. With coffee. Lots of coffee.